The co-founders of World Hum are Jim Benning and Michael Yessis. Benning was a freelance magazine writer who started at the Los Angeles Times and Orange County Register. Yessis was travel editor for the USA Today. Both were friends and big fans of Salon.com’s “Wanderlust” section. When Salon killed the section, Benning and Yessis complained until they decided to start one on their own for $30. The site was cheap to start up partly because Yessis knew website coding and set up and coded the website by hand. The site began with three stories and a call for submissions. Their goal was to bring writing and editing expertise to the site, so they had high standards. Its big break was when a World Hum story was published in “The Best American Travel Writing” anthology. World Hum did not have advertising at first, since traffic was minimal. In 2005 and 2006, however, Benning and Yessis redesigned the site, so that it could include ads. Currently, they are not selling ads on the website, but there are Google ads on the site, and these are triggered by key words on a page. Even with the ads, they weren’t making big money. The site’s revenue was modest, bringing in about $1,000 to $2,000 per year. With the owners mainly spending only their spare hours on the site, it was more of a “labor of love,” Benning said. Things changed when the Travel Channel purchased World Hum in 2006 and employed the two men full time to run the website. This brought an editorial budget and other support that allowed the site to thrive, but only for a few years. In 2010, Scripps Network bought Travel Channel and chose not to support World Hum, and Benning and Yessis were laid off. Although Travel Channel still owns World Hum, Benning and Yessis are licensed to run the site and earn profits from it. Eva Holland is the senior editor of World Hum. She first heard about World Hum while still in England; the website was in a book called the “Lonely Planet’s Guide to Travel Writing,” and she became a huge fan. While at the Book Passage Conference in San Francisco in August 2007, she met Jim Benning, and she officially started blogging for World Hum the following month. Since becoming its senior editor in 2009, Holland now manages the unsolicited submissions inbox, which has many stories from new writers. 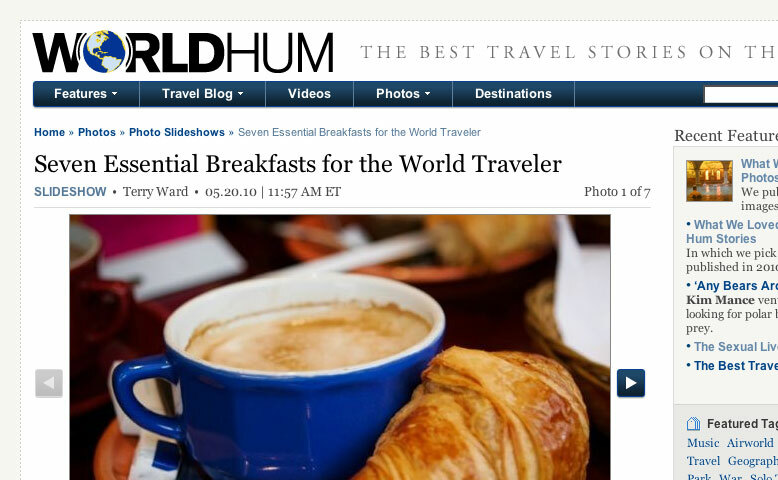 World Hum is not your typical travel site. World Hum has maintained its presence on the web by using social media to promote stories. One interesting aspect of their site is that on the homepage it has boxes where you can “like” its Facebook page, see what stories Facebook users are recommending to readers and view new and old posts from the @worldhum Twitter feed. Along with the integration of social media, the page layout is easy to navigate and nicely organized by categories. The website also has a “Destinations” tab, which allows users to browse every location that World Hum covers, which is just about every country in the world.